At Deltatre we think a lot about how to better engage and monetize viewers. The market is changing – younger generations have access to more content than ever before and shorter attention spans/tolerance for the mundane. Their expectation of how to access and experience this content has fundamentally shifted, and, most importantly, their willingness to pay for sports content is a major concern for global sports leaders around the world. Competition for eyeballs has never been more fierce. And for operators to compete, they need a suite of flexible tools that can match the consumer expectation of what the viewing experience should be while maximizing revenue potential. We believe there is no better place to start than the Video Player. After all, it’s what the viewer spends most of their time looking at, right? Over the last six months, we’ve worked tirelessly to deliver functionality that strikes a balance between providing a cutting-edge experience, monetizing an audience base and optimizing performance. Whether it’s our introduction of ‘Key Moment Alerts’ making it easy for viewers to jump to where the action is happening in real-time, or the recent update to enable VMAP, enabling operators to precisely position ad slots in live content, Diva has never been as dominant as it is today. Read on to learn what we’ve shipped recently. There’s nothing better than taking an entire afternoon to sit down with friends, enjoy some good food, and watch your favourite team play the sport you love. But unfortunately, not everyone today has the time to sit down and watch a game fully from start to finish. Instead, even the most die-hard fans sometimes find themselves having to consume ‘snackable’ content to get fully up to speed with the events in a league. The data backs this up to. According to Google, “watching of sports ‘highlight’ videos on YouTube grew by more than 80% in the past year.” In some sports that figure is even higher – for example, American football highlights nearly doubled on YouTube in 2017. This makes sense. Fans want to experience the game in the time that they have, whether that’s a full Sunday at home or the Monday morning on the way to work. It’s up to us, as content providers, to make sure that we are giving them the content they want, in the format they need, on the device of their choosing. That’s where our new feature, Auto Highlights, comes into play. As a game is happening live, key moments can automatically be compiled to an operators specifications so that a user who joins at the midway point can quickly be brought up to speed on the highlights before jumping straight into the action. These ‘cuts’ of the content can also be consumed once the game has finished for viewers who wish to consume on demand. For instance, say that your sport is compiled of many short moments of high intensity action separated by frequent breaks – like the NFL. During a game, Auto Highlights makes it possible to present multiple versions of the game that fit the users schedule at that point in time, such as one, uninterrupted stream of points being scored, or every single play without the ad breaks. 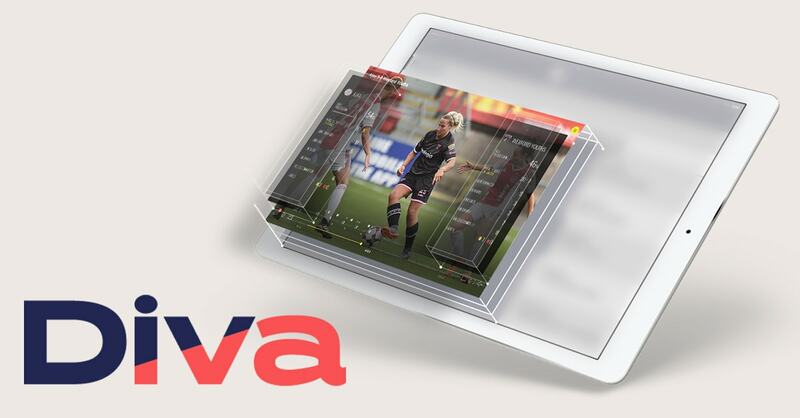 The operator is in full control of the breakdown of these highlights – it could be as simple as short, medium and long, plus the full match – and all other Diva features, such as multi-angle and data panels, are available in highlight mode. Forget the headlines that advertising in OTT is dead – research shows that ad spending on connected TV sets alone jumped by 748% in 2018 alone. Viewers aren’t finished with advertisements, they just want them to be relevant and non-intrusive to the viewing experience. Nowhere is this more important than in sports. It’s unforgivable to place an ad-break during a critical moment in the action, which is why operators need the flexibility to determine where they should appear in real-time. Video content owners must carefully manage the quantity, quality, and use of ad inventory opportunities within content to monetize effectively. This is simple when you control distribution, but becomes a lot more complicated when syndicating to a third-party. VMAP enables content owners to manage the ad inventory in their IP when they don’t control the player. It gives them the ability to monetize and maintain the integrity of their programming at the same time. Talk about a win-win, huh? The Premier League, NFL on a Sunday, the Olympics – all examples of sporting events where a lot of things are happening at the same time. And for the sports fan, it is vital not to miss a single piece of the action. That’s why we developed ‘Key Moments Alerts.’ Already available in the HTML5 player, viewers watching on mobile will now be alerted automatically by an on-screen overlay if something interesting is happening in a match or game they’re not watching live. And it goes further. Users can click the banner alert to jump to the action and, once watched, can choose whether to switch back to the video they were watching previously or remain where they are. We’ve put some serious work in developing a lot of exciting features into Diva over the years, but sometimes the user needs a little help discovering what’s possible in our next-generation player. That’s why we were proud to introduce ‘Wizard’ – a customizable layer that’s displayed the first time a user uses Diva to help them learn what’s possible within the service. Even better, operators don’t need to do any set-up. All badges are configured automatically based on the current active features for the current vide. But if they do want to change something, like matching the language used to your brand tone, all labels are customizable using the standard vocabulary file. One of the key metrics of success for any video services is consumption – how long can we keep our customers watching? - which is why it’s so important to have the functionality to surface relevant content exactly when the viewer is primed to watch it. Now, on both HTML5 and mobile, operators can quickly target additional content, whether it’s short-form clips or live matches, once the video that the user is watching has come to an end. We’ve also implemented a recommendation layer that will automatically move the user on to the next piece of relevant content as soon as they’ve finished watching. The core of our strategy is to deliver a superior service to our clients, and by extension, their audience. And in order to do this, we need a firm understanding of the data – how do they consume content, how well does the service perform under pressure and where are the points of churn. To help us achieve this goal, we decided to enter a strategic partnership with Conviva as they provide a best-in-class data solution for video delivery. They are one of the leaders in the field of QoS, meaning that our customers now have full visibility on just how well their service is performing regarding stream quality, buffering and many more across Android, iOS, HTML5, and Chromecast. Beyond this, Conviva also offers us and our customers access to deep behavioural insights that can be used to drive OTT strategy at all levels – from content acquisition to UX design to monetisation tactics. For more information on any of the above, please get in contact with a member of our team.